Why Not Just Horse Massage? Kate does not just use massage to bring your horse to its physical and mental peak. The results you want are managed by blending traditional Swedish massage with sports massage techniques and mixing remedial exercises, hydrotherapy and stretches. Kate recognizes that not all horses are the same and is constantly exploring other methods of bodywork. You may also see her use methods and ideas pioneered by Mike Scott, Jim Masterson and various equine professionals. 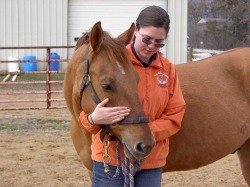 Kate is passionate about improving your horse's physical and mental state. Whether it's rehabilitating a horse from an injury or calming a nervous contest horse, that passion shines through. 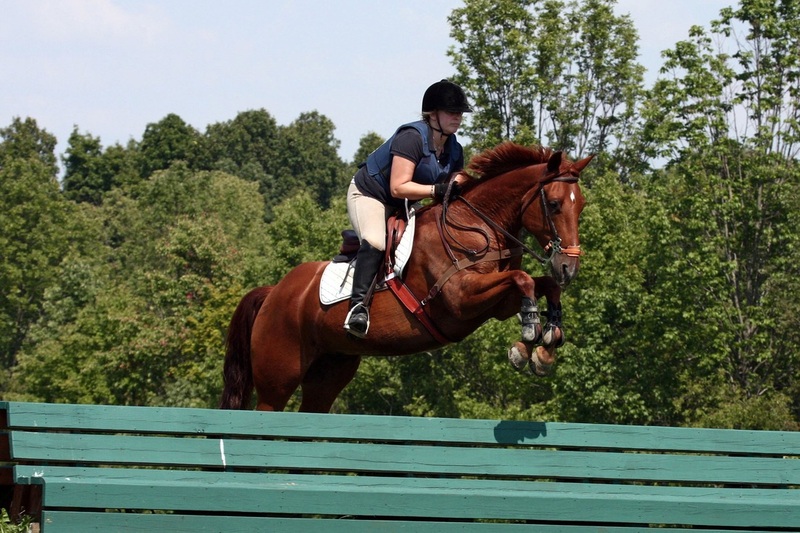 She is also ready and willing to teach you how to do many of the basics yourself to help build trust and a willing working relationship with your horse. Tara and Keene on the cross country course. They are the past champions in Novice Amateur Equitation Over Fences at the AQHA Region Four Championships. Maintenance Massage: performed as part of your regular training routine and is designed to maximize your horse's potential by helping maintain their peak condition. Rehabilitative Massage: performed after injury and is designed to help speed up recovery time while decreasing secondary issues and promoting proper healing of injured structures. This massage focuses on the removal of trigger points, relief of muscle spasms and reduction of scar tissue. Can be invasive. Studies show that using massage techniques after an injury helps speed recovery. Pre-event Massage: performed 15-30 minutes before an event, this massage decreases the risk of injury by increasing circulation and warming up tissues without wasting energy before an event while improving your horse's endurance, coordination and flexibility. Post-event Massage: performed between 30 mins to 4 hours after an event to decrease your horse's recuperation time as well as decreasing pain, swelling and muscle spasms that may occur after an event. Hydrotherapy is the application of cold or heat through the use of water (or heat packs). It can be performed by itself by request or within a massage therapy treatment. May be incorporated within a massage therapy treatment but are also used on their own. Remedial exercises can include stretching, use of cavaletti, hill work, the use of side reins and even swimming. The purpose of remedial exercises is to encourage the building and maintaining of weakened muscle groups. These exercises also help to improve the mind-body connection. Please do not attempt stretches without consultation from an experienced equine professional. Kate would like to thank Jane Laymon-Kaspar of Painted Bayou Farm for loaning Buddy to our photoshoot. He has become her well-loved mascot. Extras: Kate can perform hydrotherapy, stretching, remedial exercises and evaluations separately from massages if interested.